After Blood on the Ice, Hjerim is purchasable, regardless of Civil War involvement or lack therof. Allows you to buy Hjerim after Rise in the East. This WILL break Blood on the Ice. Remade in the updated CS. Hopefully removes the weird, nebulous problems with 1.5. Somehow Blood on the Ice got marked as Modified when it was not. Not a huge problem, just a potential incompatibility. Fixed it. I have a bit of a problem. I like saving the main quest for last, and I don't much like the Civil War quest line in general. This would leave me with a grand total of ten seconds to use this house. 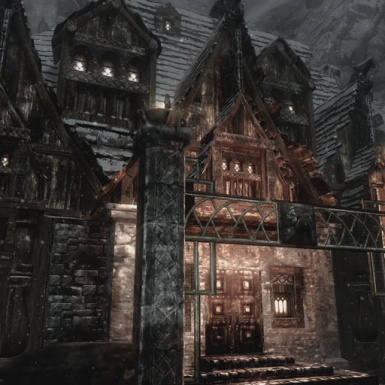 And hey, I solved a serial killing for Windhelm, and the house is empty. You'd think they'd be a little grateful! So... I decided to fix my problem. You can now buy Hjerim without having taken a side in the war at all. The only requirement is completing the quest Blood on the Ice. It does not matter who you choose as the murderer. Once someone is chosen and you are thanked, the house is buyable. The quest and the house are untouched otherwise. With 1.03, you can also become Thane of Eastmarch after Blood on the Ice. You still need to do the Favor quests, as usual. It just changes the trigger to offer this to you. This does not touch Hjerim itself, only the one exact topic to sell the house, so it should be compatible with almost anything. It does not touch the quest Blood on the Ice, I merely used it as a convenient "favor" to unlock the option to purchase the house. It's just an ESP, so pop it in your Data folder, activate it, and go. AceBox for the character save "Thane Skyher" on the Nexus. It's a pretty random credit, but having a save that had not even chosen sides and hadn't even started Blood on the Ice was helpful for testing. Niire for helping figure out how to implement the Thane change. 1.01 - Somehow Blood on the Ice got marked as Modified when it was not. Not a huge problem, just a potential incompatibility. Fixed it. 1.02 - Remade in the updated CS. Hopefully removes the weird, nebulous problems with 1.5.